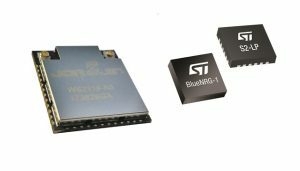 STMicroelectronics and Jorjin Technologies Inc., announced the certification of the dual-radio modules that combine Sigfox wireless-network technology with Bluetooth low energy (BLE). Fully programmable devices, Jorjin’s new Sigfox modules exploit the ultra-low power Arm Cortex-M0 technology embedded in ST’s BLE SoC to act as independent IoT connectivity nodes. The combination of BLE with Sigfox’ low-power wide-area network (LPWAN) provides key benefits to IoT systems, such as firmware update over-the-air, which is not possible with conventional ‘Sigfox-only’ modules. Other benefits of having an IoT device connected both remotely through the Sigfox network and locally through BLE include the possibility to modify device settings during installation or maintenance, or to trace assets, which often change their position inside an area covered with BLE beacon stations. “We are glad to welcome Jorjin to our ever-expanding ecosystem and to partner once again with ST for the acceleration of the adoption of the IoT among the different verticals. The certification of the Jorjin module will allow us to boost the production of Sigfox-enabled devices answering a growing demand from our clients,” said Raouti Chehih, Sigfox Chief Adoption Officer. The evaluation board for the WS211x modules uses the Arduino interface to ease customer development and is compatible with ST’s Arduino shield boards featuring MEMS motion sensors, environmental sensors, or Time-of-Flight (ToF) ranging sensors. An SDK is available from Jorjin enabling customers to develop applications using WS211x modules with ST’s sensor shield boards, as well as an AT command list facilitating customers test of the modules’ BLE and Sigfox functions.